YouTube was originally founded by three individuals, and was launched on February 14, 2005. The three founders are Chad Hurley, Steve Chen, and Jawed Karim. Chad Meredith Hurley (born January 24, 1977) is an American co-founder and former Chief Executive Officer of the popular video sharing website YouTube and MixBit. In June 2006, he was voted 28th on Business 2.0's "50 People Who Matter Now" list. In October 2006, he and Steve Chen sold YouTube for $1.65 billion to Google. Hurley worked in eBay's PayPal division—one of his tasks involved designing the original PayPal logo— before starting YouTube with fellow PayPal colleagues Steve Chen and Jawed Karim. Hurley was primarily responsible for the tagging and video sharing aspects of YouTube. Chad is the third child of Don and Joann Hurley, and grew up near Birdsboro, Pennsylvania. He has two siblings, an older sister, Heather, and a younger brother, Brent. Since childhood, Chad showed extreme interest in the arts, but then later became interested in computers and electronic media during high school. 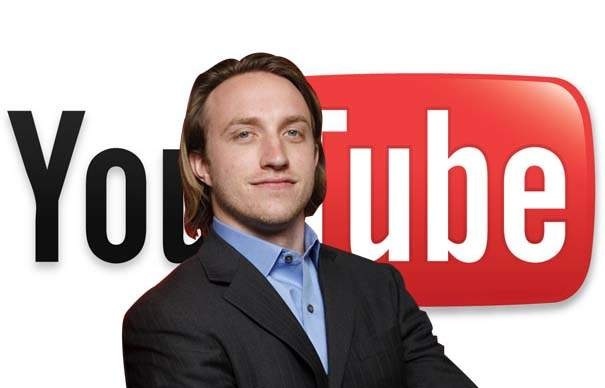 On October 16, 2006, Chen and Hurley sold YouTube to Google, Inc. for $1.65 billion. It was reported in the Wall Street Journal that Chad Hurley's share was $345.6M at Google's February 7, 2007 closing stock price of $470.01. He received 694,087 Google shares directly and another 41,232 shares in a trust. YouTube's other two co-founders, Steve Chen and Jawed Karim, received 625,366 shares and 137,443 shares, respectively valued at $326.2M and $64.6M. The Journal '​s report was based on Google's registration statement with SEC filed on February 7, 2007. Hurley stepped down as CEO of YouTube in October 2010 and stated he would stay on as an advisor of YouTube, allowing Salar Kamangar to take over the CEO position. Chad was involved as a major investor with US F1 Team, one of the new entrants in Formula One automobile racing for the 2010 season. On March 2, 2010, the team's personnel were dismissed from their duties and the team was unofficially shut down. Neither Hurley, team principal Ken Anderson, or sporting director Peter Windsor would comment on the team's failure to make it to the grid. It is rumored that Hurley is still trying to get involved with F1 via other teams. Jawed Karim (born January 1, 1979) is a German internet entrepreneur of German and Bangladeshi descent. He is best known for being the co-founder of the video-sharing website YouTube. Many of the core components of PayPal, including its real-time anti-fraud system, were also designed and implemented by Karim. Karim was born in Merseburg, East Germany, but crossed the Inner German border in 1980 and grew up in Neuss, West Germany. Karim's father is a Muslim and his mother is a Christian but he defines himself as an atheist. He moved to the United States with his family in 1999, nine years after German reunification. He graduated from Central High School (Saint Paul, Minnesota) and later attended the University of Illinois at Urbana-Champaign Department of Computer Science. He left campus prior to graduating to become an early employee at PayPal, but continued his coursework, earning his Bachelor of Science in computer science. While working at PayPal, he met Chad Hurley and Steve Chen. The three later founded the YouTube video sharing website in 2005. YouTube's first video, Me at the zoo, was uploaded by Karim on April 23, 2005. After co-founding the company and developing the YouTube concept and website with Chad Hurley and Steve Chen, Karim enrolled as a graduate student in computer science at Stanford University while acting as an advisor to YouTube. When YouTube was acquired by Google, Karim received 137,443 shares of stock, worth about $64 million based on Google's closing stock price at the time. On November 6, 2013, YouTube began requiring that commenting on its videos be done via a Google+ account, a move that was widely opposed by the YouTube community. An online petition to revert the change garnered over 240,000 signatures. Google was subsequently reported to have made drastic cuts to its Google+ division, and was planning to end forced Google+ integrations with future products. Google also publicly apologized for forcing Google+ users to use their real names, which was one of the reasons the Google+ integration was unpopular with YouTube users. On April 24, 2014, Vic Gundotra, Google’s Senior Vice President for Social and one of the creators of Google+, announced his resignation from Google. Chen was born in Taipei, Taiwan. When he was fifteen years old, he and his family immigrated to the United States. He went to River Trails Middle School in Mount Prospect for his middle school education and John Hersey High School in Arlington Heights for his freshman year of high school. For his final three years of high school, he attended the Illinois Mathematics and Science Academy in Aurora, Illinois. At the University of Illinois at Urbana-Champaign, he studied computer science. He graduated in 2002. On October 16, 2006, Chen and Hurley sold YouTube to Google, Inc. for $1.65 billion. Chen received 625,366 shares of Google and an additional 68,721 in a trust as part of the sale. The Google shares that he received were reported to be worth over $326 million about 1 year later. He and Chad Hurley have now started AVOS Systems which has acquired Delicious from Yahoo! Inc.
Chen has been listed as one of the 15 Asian Scientists To Watch by Asian Scientist Magazine on 15 May 2011. Chen married Park Ji-hyun (now Jamie Chen), a Google Korea product marketing manager, in 2009. They moved to Tunbridge Wells in 2010 and have one son who was born in July 2010 named Joseph Chen and one daughter named Clara Chen. The Chens are major supporters of the Asian Art Museum of San Francisco where Jamie was appointed a trustee in July 2012.